In our data-heavy future billions of devices are connected to the internet. Artificial intelligence is the spinal cort of our environment. 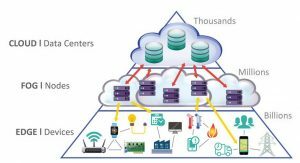 The sheer amount of IoT devices puts a strain on networking bandwidth and cloud performance. Local data processing relieves the Cloud. IP protection demands Cloud independent Nodes: Fog. AI based Edge and Fog computing support Autonomous Intelligence while reducing the load on Network and Cloud.